Ralph Lauren's Home, Oatlands in Katonah, New York when first built. My group, Mansions of the Gilded Age on Facebook has been mentioned in the September 2013 issue of Architectural Digest, page 42. Under the column AD HEARS, " Mansions of the Gilded Age is one of the liveliest design groups on Facebook, with members celebrating (and denigrating lavish examples of late-19th century and early-20th century domestic architecture". If you are on Facebook, please ask to join the group, Mansions of the Gilded Age. The group has over 3300 members and growing. You can participate, by adding photos, links or comments, or just enjoy it and read the postings of the members. It is also a wonderful venue to ask questions about historic mansions, estates or social life of the Gilded Age. Also every issue of Architectural Digest is not to be missed, but this month there is a story about Ralph Lauren's many homes. 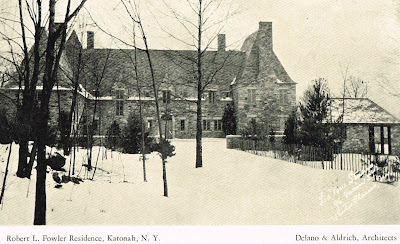 The photo above is a vintage view of his Katonah, New York home when first built.